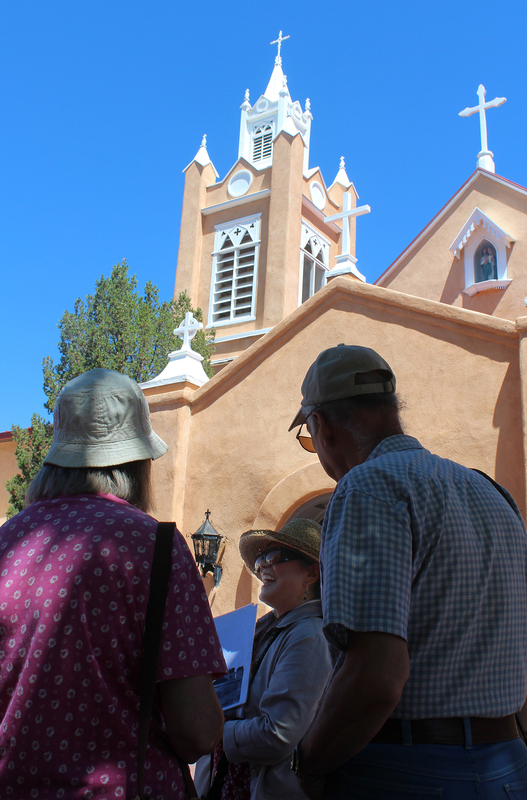 The public is invited to take a docent-guided tour of Albuquerque Museum's galleries and sculpture garden, an Old Town walking tour, or a guided tour of Casa San Ysidro in Corrales. No reservation necessary. For more information, view our Teacher and School Tours, call (505) 243-7255, or email: [email protected]. Tours are operated under the direction of the Albuquerque Museum Education Division. Group tours may be arranged by special request. School tours are offered on a limited basis. Docent guided tours of select gallery exhibitions - every tour is different! Tuesdays - Sundays: 2 p.m. No reservation necessary. One-hour docent guided tours are also offered with pre-arranged bookings. Each tour is designed specifically for the interests and age level of the group requesting the tour. Got a group of 10 or more? We would be happy to arrange a docent guided tour for you of Historic Old Town, the Sculpture Garden or our current exhibitions. General admission fees apply, special exhibition surcharges may apply as well. Contact the Education department to schedule your tour at 764-6502. Wednesday and Saturday: 11 a.m.
Sunday, Tuesday, Thursday & Friday: 11 a.m. Explore historic Old Town on foot with our informative docents who will provide insight into the people and places that shaped our early community. Open to the public. No reservations necessary. Old Town Walking Tours are not available for school groups. Tuesday to Saturday: 10:30 a.m., noon and 1:30 p.m.
Tuesday to Friday: 9:30 a.m. and 1:30 p.m.
Saturday: 10:30 a.m., noon and 1:30 p.m.